I was extremely alarmed to read in the New York Daily News that Jews in the Eastern Ukraine city of Donetsk were slapped with orders to “register” with the pro-Moscow militia that has taken over the city. The leaflets distributed outside a synagogue during Passover warned that any Jew who refused would have their citizenship revoked “and you will be forced outside the country with a confiscation of property." Now sites like the New Republic are quick to denounce this as false and accuse the Western press of spreading vicious rumors. But just because this order is not an official one from the Ukrainian government does not mean it is any less frightening. And they do not deny that the fliers were distributed; just that it was done by a small "fringe" group. Does that make it any less threatening? It was just this mindset in pre-war Germany that concluded with the deaths of over 6,000,000 Jews. Study your history ... Hitler was once part of a small "fringe" group, too. The Holocaust Encyclopedia reports that during the first six years of Hitler's dictatorship, from 1933 until the outbreak of war in 1939, Jews felt the effects of more than 400 decrees and regulations that restricted all aspects of their public and private lives. It began with a Civil Service Law that stated civil servants and employees of Jewish descent were to be excluded from state service. Then German law restricted the number of Jewish students at German schools and universities. In the same month, further legislation sharply curtailed "Jewish activity" in the medical and legal professions. A year later, the "Nuremberg Laws" excluded German Jews from Reich citizenship and prohibited them from marrying or having sexual relations with persons of "German or German-related blood." 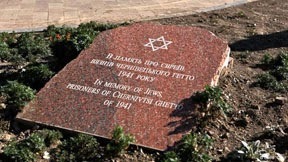 Next, the Jews lost their political rights and their participation in elections; Jewish patients were no longer admitted to German hospitals; Jews were barred from all public schools and universities, as well as from cinemas, theaters, and sports facilities; and all Jews were obliged to carry identity cards that indicated their Jewish heritage. In the middle of this madness, Jews were required to register their domestic and foreign property and assets, a prelude to the gradual expropriation of their material wealth by the state. Sound familiar? It is suspected that the leaflets are the product of anti-Semitism coming from the pro-Russian activists in Ukraine. But it doesn't really matter who distributed them; it is serious business and could fan the flames of anti-Semitism that is sweeping across Europe. I think the thing that I fear the most is that the Jews will once again be used as a pawn; this time between Russia and the West/Europe. Will history repeat itself? Will they once again become a scapegoat for a despot to begin his campaign to rule the world? Right now, this is just a minor story, buried amid bigger ones of Hillary's grandbaby and swarms of earthquakes... and that's the scariest part of all. This kind of persecution goes unnoticed until one day we wake up, and the Ukrainian Jews are living in pogroms again! Dear God, please protect Your people and don't let Evil control the world as it did in 1933. I am praying for all the Ukrainian people. They are at the center of a high-powered game of chicken, and as their future transpires, it will definitely affect our world. Proverbs 16:12 "It is an abomination for kings to commit wicked acts, For a throne is established on righteousness."